Glasschain Audio Services is a young and dynamic company based in Sydney, the founder Drew Tourle and his team have many years of experience in the entertainment business and installation projects in varies venues. The GAS sales team is happy to assist you with all your questions about the QMAXZ products and will make you an offer you can't refuse. Maktel Media is the official QMAXZ distributor for Egypt, based in the hart of Cairo"s Media City they are in the center of Egypt's media industrie , Maktel Media has supplied allready several studio's witrh new QMAXZ equipment. At this years Zulu Awards on Danish TV2, Bico Professional A/S had the opportunity to test out some QS250W units. The LD, Lars Nissen from Seelite A/S, used some units to light up some set pieces that were visible through out big parts of the show, and they units worked flawlessly together with the rest of the set-up. 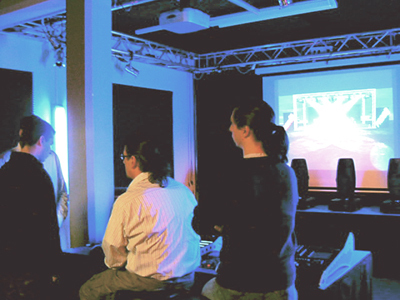 The show was shown on TV2 in Denmark in march 2009. 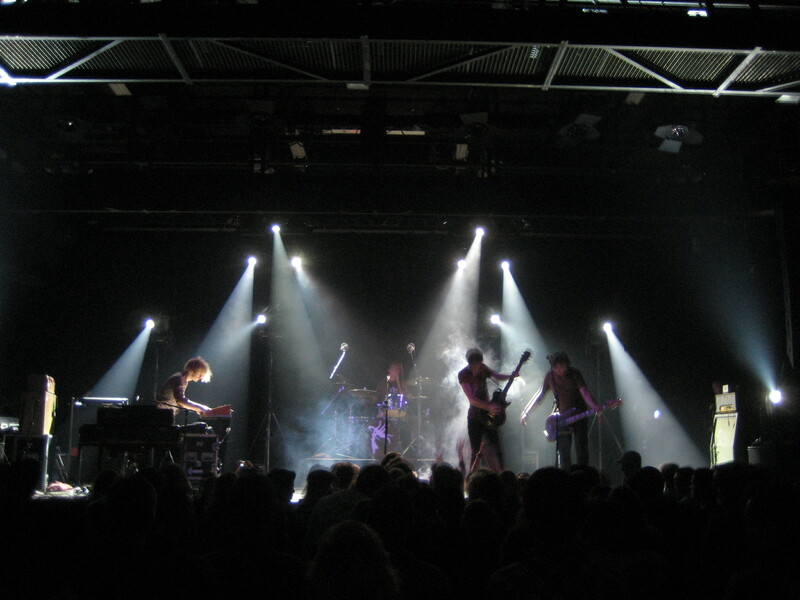 The QS250 units has also been tested on gigs with some Danish performers such as Carpark North, Camille Jones and Die Herren (Danish U2 copy band) – all were very satisfied with the result. 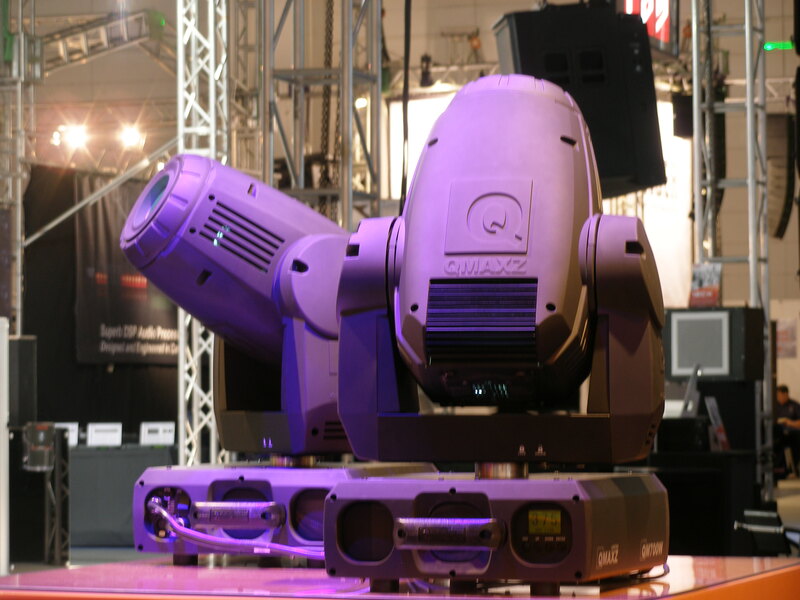 The new QME700P is a powerful moving fixture designed for TV, Theatre, large venue’s, big events and installation purpose. It’s precise and smooth blending full CMY mixing with variable CTO makes it a powerful tool. The QME700P uses the Philips 700Watt MSR Gold 700/2 Fast-Fit (7.500°K) light source which, together in combination with her super-efficient optic line, is producing an outstanding high and bright output. It’s equipped with Electronic Ballast, an Electronic Powersupply and Powercon™ connection. All 8 metal gobos, 6 glass gobos and dichroic colors are in interchangeable. Plus all gobos and dichroic colors are adjustable within 7 steps for even more precise placing when needed. Inputs are 5 pin XLR, ART-NET protocol, sACN and RDM. Software is updatable via RDM. On extra FX’s we placed an interchangeable rotating Animation wheel with autosnap, variable frost, Indexable rotating Prism and motorized Iris. The new QME700P is designed for the professional user who needs that extra bit more. Look here for specs ! For the fifth year running Stage Electrics’ Welsh trade show is being held at the Royal Welsh College of Music & Drama in Cardiff on Thursday 16 October 2008 from 11am – 5pm. The show will feature all the very latest entertainment industry technology and exhibits from leading industry lighting and sound suppliers. Leading suppliers Avolites, ETC, Le Maitre, Lee, MA Lighting, Martin, Pulsar, Rosco, Selecon, Strand, & Zero 88 will be exhibiting their latest products, offering demonstrations and providing product advice. 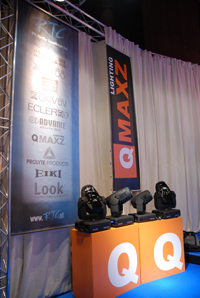 Other products on display include Qmaxz Moving Lights, the Xenonspot follow spot, Apollo Right Arm . 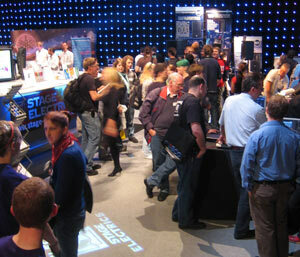 Stage Electrics are pleased to announce PLASA will be joining us this year. PLASA is the industry's major trade association and will be there to answer any questions you may have and to discuss the benefits of membership. RTC at the Meet 2008 in Bregenz. 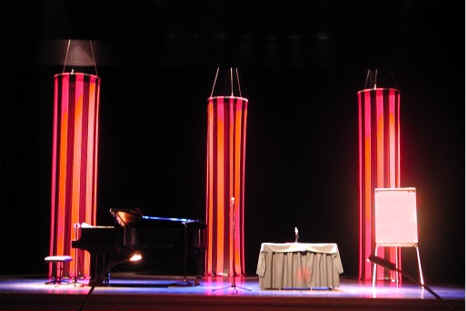 The seminar was held in the beautiful 'Singer theatre' in Laren. We do thank Gerard van Gemert for his exellent demostrations on the multipurpose of Qmaxz products next to conventional lighting products. This very successful day was well visited by people from the theatre and broadcasting industry. Again an overwhelming show. Also the launch of the new QME700P spot looks at a bright future The new QME700P with CMY, animation wheel, Ethernet, RDM and many more features is the new flagship. We especially did enjoy this opportunity to spend quality time with our partners, friends and Qmaxz users, discussing this interesting industry. 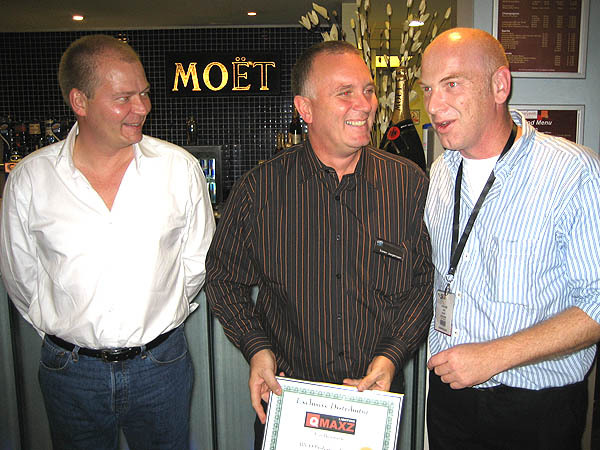 BICO Professionel a/s is our new exclusive distributor in Denmark. 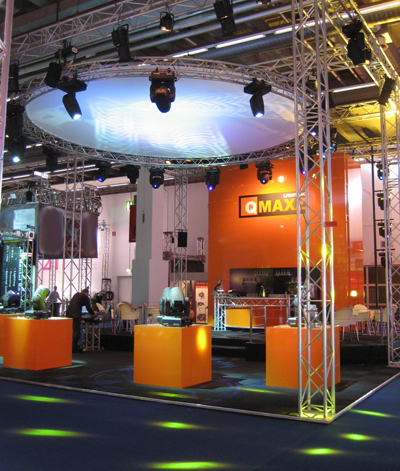 We are in exquisite hands of the professionals in the lighting market of the Northern countries in Europe. Please visit them for contact details at www.bico.dk. 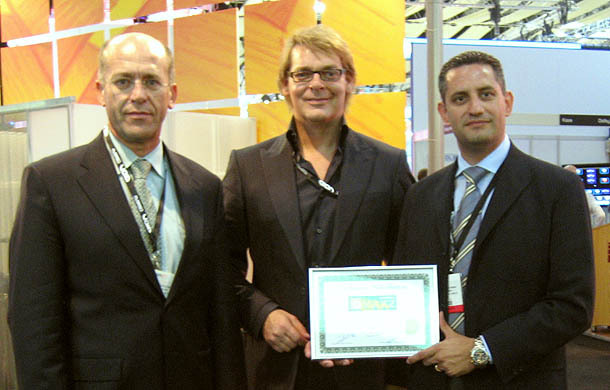 From left to right; Mr. Hans Hendrik Schmidt, Soren Jorgensen from BICO with Bob Roos, European Sales Manager Qmaxz. Qmaxz QM575 Serie for Singer Theater. The Singer theater is one of the first theaters who did have a vey important role in the history of national TV. These days the Singer Theater still welcomes the top in cabaret, musical, music and great playes. Prolight+sound 2007. 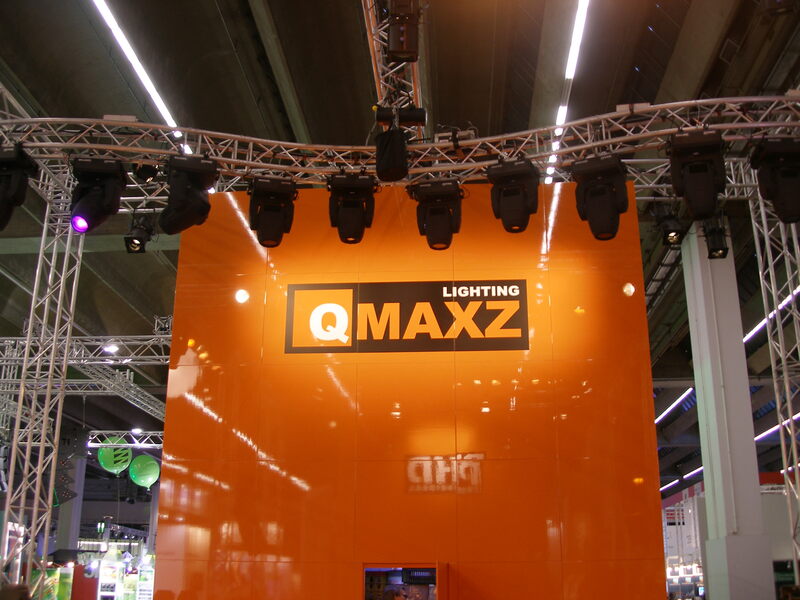 It was a lot of hard work for the entire Qmaxz team but at the end it was absolutely a fantastic event and we enjoyed every single minute of it. Thank you all for visiting us! The Sheer is starting there new Dutch club tour in Holland using QM575 Spots and Washes. 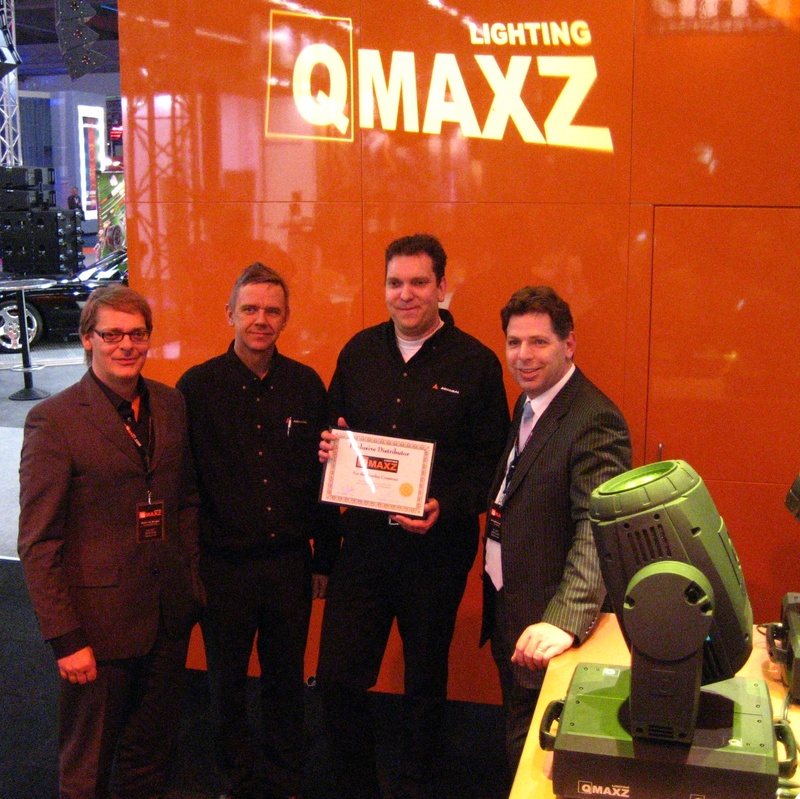 Their lighting engineer/programmer Wim Keller, is excited using Qmaxz. Please vist http://www.thesheer.nl/ for tourdates. Also keep checking Dutch national radio & tv stations! They are great! !